The chestnut brown 1963 Ferrari 250 GT Lusso wasn't the only barely-disguised race car McQueen drove on public roads: there's also this canvas-topped 1956 XKSS Le Mans racer. And you’re done! Notice how it’s remained a race car with a featherweight carbon fiber body and a 700 HP V12 turbodiesel. 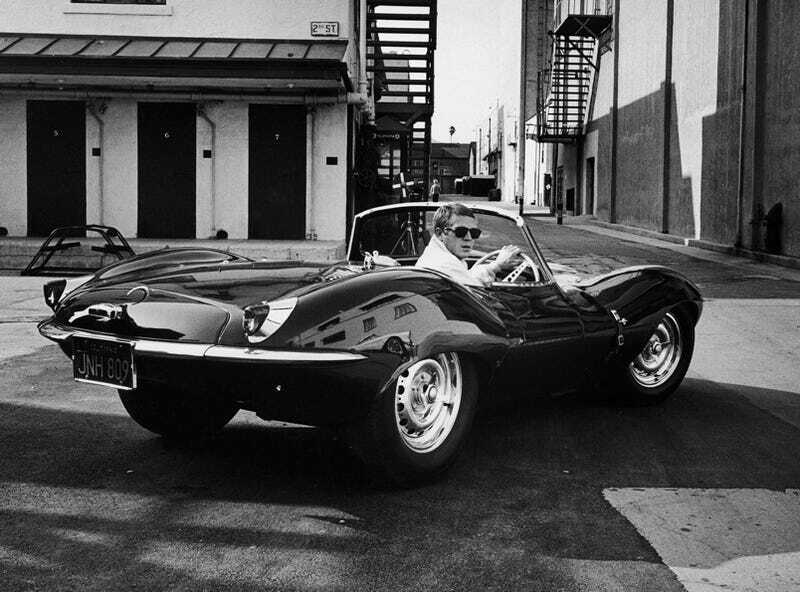 But the engine in the XKSS was not a turbodiesel. It was a gasoline-fueled straight six with triple Webers, good for 250 HP, brain-meltingly loud at 6,000 RPM and also very pretty. In a very British way. It was not only the engine which made the D-Type such a monster at Le Mans. The body was an aluminum monocoque, carried over from aircraft manufacturing. Very advanced for its day of body-on-frame and superleggera designs, with an aerodynamically shaped underbody for low drag. And, of course, that giant asymmetrical fin behind the driver’s seat, good for stabilizing the car when you were screaming down the Mulsanne Straight at 180 MPH. The D-Type won at Le Mans three times in a row. Fifty years after its last victory in 1957, I was wandering about the parking lot at Le Mans, waiting for the 2007 race to begin, when I spotted one. It had apparently been driven to the race on the public road. Armed with a brochure which depicted Mike Hawthorn—the man who drove the D-Type to its first victory here—I reunited car and driver. Human biology would have allowed for such a reunion without my help, as Hawthorn would only have been a springly 78 on this cold, damp June day. But he had already been dead since 1959, having crashed his souped-up Mk1 Jaguar into a tree. Four years after eighty people died at the very Le Mans race he won. Two years after nine of the planned 25 XKSS’s were destroyed in a factory fire, resulting in the 16 examples ever made of the car. Perhaps this is why D-Types are so downright frightening in person. They carry their grim history like a personal thundercloud tied to that massive shark fin of theirs.